When and are 0, the distribution is the Poisson. When is 0, the distribution is the negative binomial. The Delaporte distribution is a discrete probability distribution that has received attention in actuarial science. It can be defined using the convolution of a negative binomial distribution with a Poisson distribution. 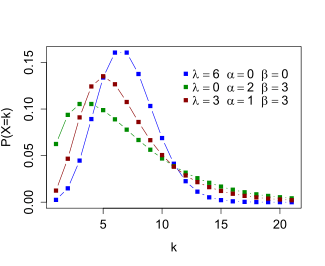 Just as the negative binomial distribution can be viewed as a Poisson distribution where the mean parameter is itself a random variable with a gamma distribution, the Delaporte distribution can be viewed as a compound distribution based on a Poisson distribution, where there are two components to the mean parameter: a fixed component, which has the parameter, and a gamma-distributed variable component, which has the and parameters. The distribution is named for Pierre Delaporte, who analyzed it in relation to automobile accident claim counts in 1959, although it appeared in a different form as early as 1934 in a paper by Rolf von Lüders, where it was called the Formel II distribution. ↑ Panjer, Harry H. (2006). "Discrete Parametric Distributions". In Teugels, Jozef L.; Sundt, Bjørn. Encyclopedia of Actuarial Science. John Wiley & Sons. doi:10.1002/9780470012505.tad027. ISBN 978-0-470-01250-5. 1 2 3 Johnson, Norman Lloyd; Kemp, Adrienne W.; Kotz, Samuel (2005). Univariate discrete distributions (Third ed.). John Wiley & Sons. pp. 241–242. ISBN 978-0-471-27246-5. ↑ Vose, David (2008). Risk analysis: a quantitative guide (Third, illustrated ed.). John Wiley & Sons. pp. 618–619. ISBN 978-0-470-51284-5. LCCN 2007041696. ↑ Delaporte, Pierre J. (1960). "Quelques problèmes de statistiques mathématiques poses par l'Assurance Automobile et le Bonus pour non sinistre" [Some problems of mathematical statistics as related to automobile insurance and no-claims bonus]. Bulletin Trimestriel de l'Institut des Actuaires Français (in French). 227: 87–102. ↑ von Lüders, Rolf (1934). "Die Statistik der seltenen Ereignisse" [The statistics of rare events]. Biometrika (in German). 26: 108–128. doi:10.1093/biomet/26.1-2.108. JSTOR 2332055. Murat, M.; Szynal, D. (1998). 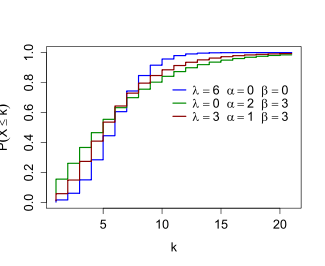 "On moments of counting distributions satisfying the k'th-order recursion and their compound distributions". Journal of Mathematical Sciences. 92 (4): 4038–4043. doi:10.1007/BF02432340. Delaporte distribution at Vose Software. Details of derivation.